Fulfilling the American dream of owning your own home can be a little intimidating.There are a lot of decisions to be made: where to live, what kind of home to buy, and how to finance your purchase are just a few of the issues to consider. We believe in our homes, our people, and in the quality materials and methods used in building our homes. Our goal is to make your new-home experience worry-free. 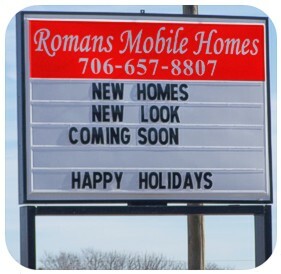 Roman's Mobile Homes also works directly with Local Banks and Lenders to save YOU thousands on Bank Foreclosed Mobile and Manufactured Homes by well known Manufacturers. Never PAY to much give us a call to Save THOUSANDS!